John Lennon is Alive in the New Novel "Saint John Lennon"
Palm Beach, FL, November 08, 2017 --(PR.com)-- December 8th is the anniversary of John Lennon’s murder. His message “love is the answer” is the desperately needed antidote to what ails the world. 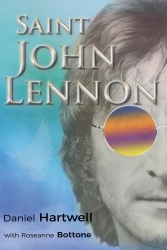 The newly released novel "Saint John Lennon" - a compelling mix of history, fact, fantasy and music - reminds us “we are all one.” On December 8, 2020, 40-year-old John Lennon mysteriously appears in front of the Dakota in New York City to begin an intriguing adventure. John deals with today’s hot topics: political discord, climate change, nuclear threats, terrorism, violence, and poverty. He re-establishes his relationships with Yoko, the Beatles Paul and Ringo, and most poignantly, with Sean and Julian. In the book, John says, "Change begins with a thought; then a declaration. Words are powerful! They have mobilized grass roots initiatives, shaped the course of world history, and affected the fate of nations. Give peace a chance! Say it! Say it out loud and with conviction!" Author Daniel Hartwell says, "It’s about time we bring creativity to our discussions about how to achieve peace and stability. Considering mass shootings, threats of terrorism, domestic violence, and the degradation of our environment, it is evident our traditional ways of addressing these challenges aren’t effective." Author Daniel Hartwell is a renowned concert promoter and positive living specialist. He lives on an ocean beach in Florida. Co-writer, Roseanne Bottone, is an environmentalist and former Peace Corps Volunteer. She lives in the Poconos in Pennsylvania. Reporters may receive a complimentary review copy of Saint John Lennon, or for additional information, contact the author Daniel Hartwell at 508-344-5333 or danielsemailnow@gmail.com. Available in Kindle and paperback versions on Amazon.com; in NOOK and paperback versions on BarnesandNoble.com; and as an iBook at iTunes.apple.com. Published by United We Rock LLC.